It is tempting to imagine, in teaching and elsewhere, that the more you plan and prepare, the better things will turn out. Up to a point, this is true, but too much planning can go awry, and a bit of spontaneity can set things right. When you plan too hard for something, and it doesn’t turn out the way you intended, the overplanning is partly at fault. I don’t mean that teachers should improvise all the time–but we should be willing to adjust course. We say this continually but still forget it. For weeks I had been planning a lesson on poetic song verse (for a twelfth-grade English class). It didn’t go as I had hoped. I had envisioned it as part planned, part spontaneous: I would present some songs, and students would too. We would see what came out of the combination. But four students were absent; of those present, only a few offered comments, and no one presented songs. I found myself speaking rather stiffly about the songs I had brought; I don’t think I conveyed much. We have only one class left, and then the students graduate–so I wish I had done better somehow. I understand, though, that the students are ready to move on with their lives. But another class that day turned into song. We went over a test that the students had taken the day before, and then I taught them the song “Today,” which I sang at my high school graduation and which I thought they would enjoy. (I think they did.) Then they asked to sing songs by Abba and Queen, and I happily went along with that (and introduced a couple of songs too). Day after day, we have been preparing for their school-leaving exams, so this was a nice way to spend time with them before the end. The contrast helps me see something else as well. In the lesson on poetic song verse, I wanted us to talk about the relation between a song’s lyrics and its music. I thought I had brought memorable examples (Townes Van Zandt, Leonard Cohen, and others) that they might not have heard otherwise. I realize, though, that it’s a mistake to talk analytically about a song before actually absorbing it. It’s hard to talk about songs at all, but it’s especially difficult in a rush. The students needed time that wasn’t there. If we had had the semester ahead of us, and if it had been a course on songs, then there would have been time. But we are at the end. Also, songs have a visceral effect. You can’t persuade others to like them–or maybe you can, but only under the right conditions. I remember how others introduced me to various songs over the years–in class, in conversation, at concerts, etc. Some of these songs became favorites; others I never grew to like. Liking isn’t necessarily the point–but when I share a song with someone, or when I teach it formally, I hope that the person will ultimately find it worth hearing. Even that can’t be guaranteed. Maybe the lesson went better than I thought. Maybe there was something interesting in it for someone. But if it did flop, it’s partly because I had planned something that didn’t match the situation–and didn’t fully realize this until the lesson was over. Otherwise this was a profoundly good day–but more about that another time, when it is not so late. There is a lot to say. At the end of the day I took part in the Holocaust memorial run–from the sugar factory to the synagogue–and then danced with many others in the evening light. Yesterday was not a typical Saturday or Shabbat. In the morning, in Budapest, I co-led a synagogue service hosted by Szim Salom, Bét Orim, and a the West London Synagogue. It was a great occasion: some people in the room had never met before, while others had known each other for decades. We came together without effort (at least in the moment–there was effort in the preparations), and layers of voices filled the room. If someone were to ask me why I believe in God, I would reply, “Because of the human voice.” It’s only a sliver of a reason, and it’s as hard to explain that as to explain what it means to me to believe in God in the first place (even saying this much gets my words tangled), but even so, there’s something to it. In some way the human voice, especially the singing voice, does not die. Also, voices carry other voices; we bring memories into our singing, sometimes centuries of memories. 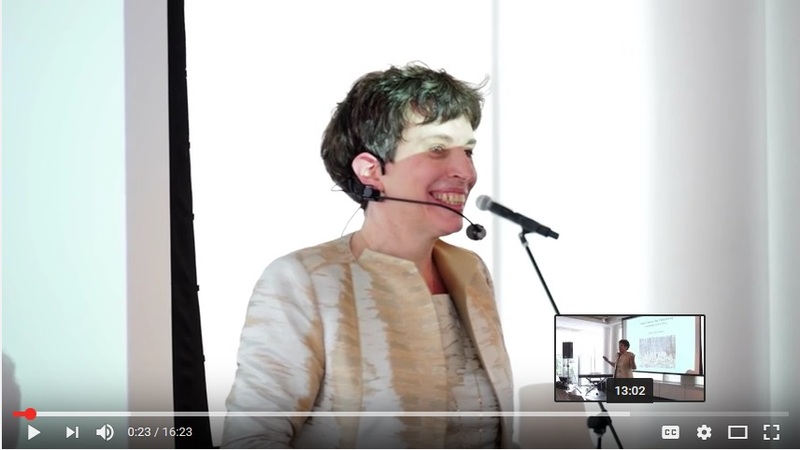 There are moments in a Jewish service, and services of other religions too, when different levels of the past come together with the present. That’s what it was like all morning–but I wasn’t thinking of that. I was happy to be together with so many people, to be co-leading the service in a way that felt like being carried up and along. Saying this, I understand a little better what happened six years and a few months ago, when I learned my first words in Hebrew. I listened to a cantor’s recording of the Blessing Before Haftarah, and something drew me in, something more than a beautiful voice or melody. It shook some kind of memory, though of what, I couldn’t say. I don’t mean anything mystical by this; I just mean that a few things happened at once. First, I knew that this was profoundly mine; second, I knew it belonged to many others too, of many centuries; third, I wanted to learn what it was all about, what the words meant, what on earth a Haftarah was; and fourth, there was something about it that went beyond explanation, maybe something mystical after all. All of this together launched the learning that carried me up to the present. Afterward, after lingering for a little while to speak with people, I walked to the train station, caught the intended train, returned to Szolnok, biked home, dropped off my backpack, fed Minnaloushe, and then biked to the Verseghy Ferenc Library for the events I had been awaiting: a reading by László Darvasi (wonderful–very funny at moments, even to me, though I understood only a fraction of the humor), and then the Varga Katalin Gimnázium Drama Club’s performance, in a packed hall, of Farkasok (Wolves), a play by one of their members, Kata Bajnai. Many of my students were in the cast. There too, I didn’t understand everything, but I was taken by the clarity and starkness of the play and by the intensity of the acting. Each word and motion mattered. The audience was rapt. I hope to see it again and hope that the text will be published. 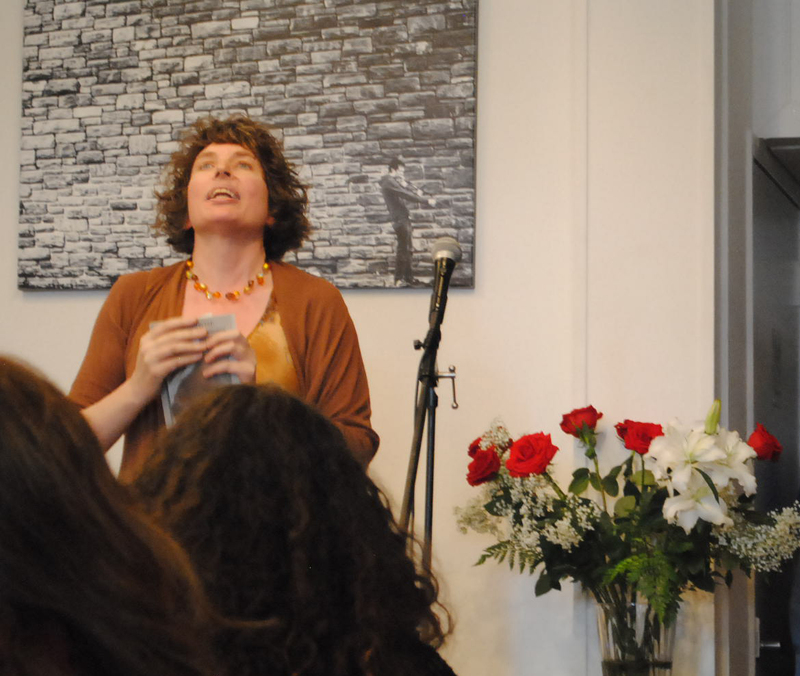 After that, I went back upstairs with two of my colleagues to hear a poetry slam performance. I don’t always like poetry slams (to put it mildly), but this one won me over. The performer, Kristóf Horváth, got the audience to come up with multi-syllabic words and phrases that fit a given meter. Then he put them together and had us chant the whole improvised poem. People of many ages cheerfully pitched in. But I was going to write about something else (related, though, in some way, to all of this). I have been thinking about how some of the most important advice is essentially ungivable. There is no way to understand it except in retrospect, and no way to phrase it in time. If I were to give advice to my former self (my teenage self, for instance), it would be something like this: “Do not doubt the worth of that essential, unchanging part of you. That is your contribution to the world; it is supposed to be there.” So many young people (and older people too) wish part of themselves away, especially those parts that stand out, that don’t seem to mesh with the surroundings. But how do we know which parts of ourselves are essential and changeless, and which parts are changing? This takes time and participation in the world. We learn about ourselves through doing things, getting to know others, making mistakes, making our way through life. Also, the relation between the changing and the changeless is complex. I think I have always been both bold and shy, but over time I have gotten better at acknowledging both. A person does not have to be just one thing. Nor are boldness and shyness inherently good or bad; they can be shaped in many ways. Moreover, the “changing” part is not necessarily less important than the “changeless” part; there’s vitality and loss in the transformation. Back to the supposed advice: what does it mean that the unchanging part is “supposed” to be there? Despite believing in God in some way, I do not imagine a divine power creating and watching over each of us. It is likely that through evolution, humans became different from each other; these differences and distinctions gave us an advantage, since we could learn from each other and had to find ways to communicate. So from this standpoint, each person has something to contribute to the whole, even negatively. But there is more to life than contributing to humanity as a whole. Yes, each of us is a tiny part of an immense field of action, which is in turn a tiny part of a more immense one. But we were given this strange gift of “I,” a self that eventually learns that it is not the center of the universe, but still never shakes its own importance entirely. What is this self for? If we were really supposed to serve humanity as a whole, shouldn’t the self have phased itself out? Wouldn’t we be better off as highly skilled and somewhat diverse carpenter ants? The self brings with it a paradox: it (the self) prevents us from seeing others fully, but only through the self can any of us see another. Without a self, there would be no listening or speaking. But the self also blocks things out; it’s at once the keenest and dullest of instruments. So it sometimes needs a good shaking. Everyone, having a self, has something to work with and an infinity of things to take in (or not). The ungivable advice is that this is all worthwhile. Or at least some of it is, and that part requires the rest. I took the photo on Friday morning. Also, I revised the piece on April 18. A photo I took by the Zagyva this morning, and a new poem. but for its way of sounding like a stream. to claim such water-tossings? Nobody. and purity does not give up midway. but something harder: knowledge of the law. along with a true love of catching them. we lift each other up in difference. hurl follies at the margin’s lilting line. As usual, I made a few changes to this after posting it. One of my favorite words in Hungarian is “bonyolult,” (“complicated, messy, intricate”), which sounds like what it means: all wound up in a bundle. According to Wiktionary, it is the past participle of bonyolul, (“to become complicated”), “an archaic verb which was formed from the bonyol- stem of bonyolít (‘to make something complicated‘).” Some linguists trace bonyolít to the Proto-Finno-Ugric *puńa (“to wind up, twist”). The photo above (which I took on Sunday evening) expresses bonyolultság well. The stump is full of life: if you look closely, you can see leaves on some of its thin branches. The water looks dark, but in the upper left corner, there’s a hint of pink (since the camera is facing north or north-northeast, and the sunset was not yet over). I would not say that complexity is the crowning principle of life. It goes along with certain simplicities. Complexity on its own becomes unintelligible, whereas simplicity becomes reductive. Neither one, at the exclusion of the other, can be beautiful, nor does the combination guarantee beauty. Beauty is one of the strangest things in human life: on the one hand subjective and private, and on the other, breaking out of subjectivity; on the one hand, conditioned by society, and on the other, proudly unconditioned. When you find something beautiful, you are all alone and in company, both of these purely, both at once. This weekend I bicycled from Szolnok to Szeged–most of it on the first day, and the remaining 2-3 hours on the second. It was a glorious trip, with long stretches through fields and forests, where I saw farm animals, deer, rabbits, storks, red pheasants (? ), and many trees in bloom. I had originally planned to spend the night in Csongrád, but arriving there at 3:00 in the afternoon, I decided it was too soon to stop, and headed onward to Ópusztaszer, along the Tisza. I made a reservation at a guesthouse there. I was bicycling through fields, on dirt roads, at sunset, and arrived in town shortly after dark. When I came to the guesthouse, the owner said that they were full–but when I explained that I had made a reservation and paid for it, he decided to look more closely into the situation. He took me to another nearby guesthouse, where a room was available, and we sat down at the computer together. Eventually we figured out what had happened; I had made the reservation online, but before checking his email, he had subsequently rented the room to someone else. He and the host of the other guesthouse (perhaps a married couple) apologized for the situation and offered me a room there. I happily accepted; it was a lovely, elegant bedroom with all the comfort I needed for the night. We worked this all out in Hungarian, which is nothing unusual for me now, but still rewarding, given that they were strangers and this situation was new for us all. So the takeaway might have been, “They messed up,” but the reality was far different. I was treated not only to a room, but to their helpfulness and kindness, and their willingness to look into an error. While I was biking, a few momentous things happened in the U.S.: Robert S. Mueller released his report on his investigation of Russian interference in the 2016 election and possible collusion with the Trump campaign; the investigation also considered whether Trump had obstructed justice. While finding no evidence of collusion or conspiracy between Russia and the Trump campaign, Mueller explicitly refrained from drawing conclusions regarding Trump’s possible obstruction of justice. Later (after I returned to Szolnok), Attorney General William P. Barr delivered his own summary and concluded, on his own authority, that Trump had not obstructed justice. This quickly turned into a takeaway: Trump trumpeting that he had been EXONERATED (in capital letters). This is yet another time to “take away the takeaway”: Mueller’s hesitation to draw a conclusion should not be so quickly translated into a certainty. This is out of my hands; what happens or does not happen from here will have nothing to do with me. I was about to say, “if there were ever a time to take away the takeaway, it is now,” but that is not true; there are other times, other occasions, every day. How many times do we rush to conclusions that favor or disfavor us–that confirm, in some way, what we want to think? How many times do we take a tenuous statement as absolute truth? Takeaways have their place, but they should not have the final say; they need courageous unrolling. I will write about this again soon in relation to Hamlet. The first photo is of Ópusztaszer; the second, of a dirt road near Dóc. If you zoom in on the upper part of the second picture, you can see a jackrabbit on the road. Most of the deer and rabbits were much too fast for the camera, but this one hesitated. 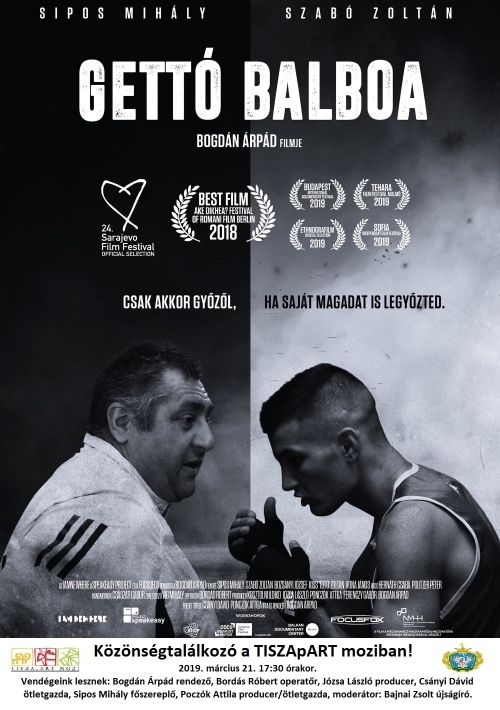 A few weeks ago, the faculty at Varga received an invitation to a Tisza Mozi screening of the 2018 documentary Gettó Balboa. Knowing nothing about it except for a basic description, I signed up right away. Tonight a colleague and I went. I stayed at school until 5:00, grading tests and such, and then zipped off on the bike, down Szapáry utca, and then around the corner onto Templom út and to the cinema. Everything was starting to light up: the gallery, the street lamps, the Mayfly Bridge. Gettó Balboa depicts a former Budapest mafia man from the Budapest Ghetto who turns to God, turns his life around, and begins to train poor ghetto children and young adults in boxing. One young man in particular, Zoli Szabó, he supports through difficulties that might otherwise have crushed him. Both he and Zoli are of Gypsy (Roma) origin, as is the director, Árpád Bogdán. This is both important to the film and not; the audience was Gypsy and non-Gypsy, and afterward, in the lobby, Gypsy chefs treated us to a delicious stew. But the film was about poverty too and what it does to a person–and about kindness and fighting, which we all know in our own ways. What does it take to help oneself and others? What does it mean to fight with all your soul? The black-and-white cinematography–sometimes crystal-clear, sometimes flattened into silhouettes, sometimes blurred with flashes of light–took me into the hardship and beauty. After the film, there was a discussion–which came as a surprise to me–I had not known about it in advance–led by the author and journalist Zsolt Bajnai, with Árpád Bogdán (the director), Róbert Bordás (the cinematographer), Attila Poczók (the producer–at least I think he was there), and Mihály Sipos (“Misi,” the protagonist). They discussed, among other things, the process and techniques of filmmaking, the film’s themes and messages, and their own impressions of it. Then, after eating some stew and saying goodbye to my colleague, I biked up onto the Mayfly Bridge (where I ran into one of my neighbors) and soon afterward turned around. I had thoughts about the nature of kindness: how many directions it takes, how many illusions it can hold, and how simple it can be nonetheless. And about documentaries: how they distill real events into forms, how they can come close to poetry. And about Szolnok, which has opened up to me slowly over the months, and which I am starting to get to know in new ways. And other thoughts, harder to pinpoint, which carried me home. Well, no, this was not the first stork, but the first I have seen in 2019. That there have been thousands before, and will be thousands more, only lifts the event; without repetition, life would be dull.